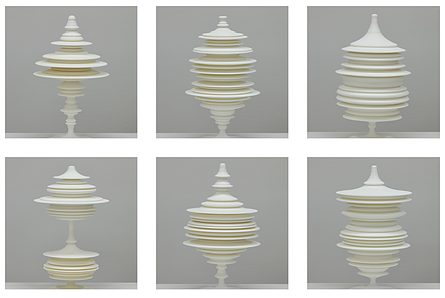 Manifest is a series of data-driven sculptural forms. Numerical data was collected from EMG (electromyogram) recordings of electrical activity produced by bodily movements. Neuromuscular activities associated with experiences of wonder (delight, confusion, disbelief) were performed as facial expressions and bodily movements (frowning, smiling, swallowing). An Arduino EMG device was used to record the electrical levels in muscles. Each activity produced unique data that was translated into a curve using a custom Processing program. The curve then became the profile for a bilaterally symmetrical model for 3D printing. The project examines the potential for objects to embody human experience and to materialize the intangible.